Description: Perennial herb 2-5 dm high, with (1-)3-6(-10) basal rosettes usually elevated above the ground on a branched, woody caudex; flowering stems 1 per basal rosette, arising centrally and terminating the rosette, glabrous; basal leaves broadly oblanceolate, 12-40 mm long and 5-10(-14) mm wide, margins shallowly dentate, simple marginal trichomes present on the petiole only, blade surfaces pubescent with forked to 4-rayed trichomes; cauline leaves alternate, lanceolate, auriculate, glabrous, 1-2 cm long; inflorescences elongate, ebracteate racemes; pedicels ascending at anthesis, horizontal or slightly ascending in fruit, lower fruiting pedicels 11-19 mm long; flowers pale lavender, 7-9 mm long and 3-4 mm wide; sepals 4, green to purplish, glabrous, 3-4.5 mm long, 1-2 mm wide, oblong; petals 4, pale lavender or white at anthesis, quickly fading to lavender, glabrous, 6.5-8.5 mm long, 1-2 mm wide, spatulate; stamens tetradynamous, slightly exceeding the sepals, pollen a mixture of narrowly ellipsoid, regularly tricolpate grains and shrunken, malformed grains; carpels 2, connate, equaling the longer stamens at anthesis but quickly elongating, ovary glabrous, style 0.2-0.5 mm long; fruit a compressed (latiseptate), linear silique, usually gently recurved, 3-7 cm long, 2-4 mm wide, seeds irregularly biseriate. Flowering March and April. Similar Species: As is usually the case in Boechera, identification can be difficult. 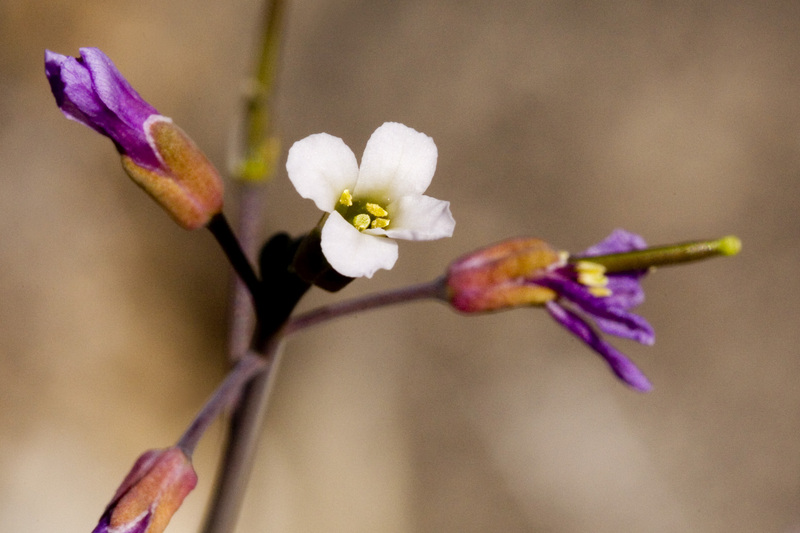 However, glabrous sepals are unusual in the Boechera of New Mexico, and in the southern half of the state are shared only with Boechera carrizozoensis and Boechera porphyrea. Boechera carrizozoensis has basal leaves that are narrower (usually <5 mm, vs. >5 mm, wide), with prominent, simple, marginal trichomes along their entire lengths (vs. only on the petiole) and surfaces that are glabrous or with sparse simple and forked trichomes near the margins (vs. uniformly pubescent with forked to 4-rayed trichomes). Boechera porphyrea usually has flowering stems arising laterally from the basal rosettes (occasionally, and mostly to the north of B. zephyra, it has single flowering stems terminating the basal rosette) and basal leaves with sharply dentate (vs. shallowly dentate) margins and at least a few 5- or 6-rayed trichomes on the surfaces (vs. forked to 4-rayed trichomes). It may be necessary to examine pollen in some cases; the well-formed grains of B. porphyrea are spheroid and irregularly colpate (vs. narrowly ellipsoid and regularly tricolpate). Distribution: New Mexico: Dona Ana, Eddy, and Otero counties; Texas: Hudspeth County. In the Guadalupe Mountains, Cornudas Mountains, Hueco Mountains, and Sierra de las Uvas. Habitat: Boechera zephyra is found on rocky slopes of varying geology (either syenite, limestone, or basaltic scoria), primarily in the upper margins of Chihuahuan Desert scrub, occasionally in juniper savannah or oak-juniper woodlands. Frequent associated plants include Dasylirion, Cylindropuntia imbricata, Opuntia engelmannii, Mimosa biuncifera, Bouteloua eriopoda, Bouteloua hirsuta, Eragrostis, Leptochloa dubia, Eriogonum wrightii, and Pellaea truncata. Remarks: This has only recently been recognized as a distinct species (Alexander et al., 2015) and was only collected once prior to 2005. In the classification of Rollins (1993) it falls within his concept of Boechera fendleri, while in the more recent work by Al-Shehbaz and Windham (2010) it could key to either B. porphyrea or Boechera texana. It is an apomictic diploid hybrid between Boechera perennans and Boechera texana. Despite its hybrid origin, it forms a lineage that is genetically distinct from and reproductively independent of its parents. At present, these parents are not known to occur together. Conservation Considerations: Most of the known populations are in remote locations that are relatively undisturbed, and usually occupy sites that are steep enough to limit cattle grazing or other potentially disruptive land uses. Mechanical or chemical treatments to remove woody vegetation may be a threat, but have not yet attempted in the habitat of this species. Mining of nepheline syenite at Wind Mountain is being considered and could pose a threat to the largest known population. Alexander, P.J., M.D. Windham, J.B. Beck, I.A. Al-Shehbaz, L. Allphin, and C.D. Bailey. 2015. Weaving a tangled web: divergent and reticulate speciation in Boechera fendleri sensu lato (Brassicaceae: Boechereae). Systematic Botany 40(2): 572-596.